Balut. The notorious Filipino street dish. Its a duck embryo inside of a hard boiled egg. A powerhouse of cheap protein, but maybe not to everyone’s taste. American/European meat preferences are quite different to mainstream Filipino expectations. Filipinos use every part of the animal to cook, and are very creative in utilizing body parts that westerners turn their nose up at: tongue, heart, lung, feet, bone marrow, cartilidge…you name it. Most westerners squirm and make faces at just the thought of grilled lung on a stick. I don’t eat meat at all, so I take the western luxury of choice and preference to a whole new level. Vegetarianism is truly a luxury for those that can afford it or, for the poor or devote (not in the Philippines), the most dire and humble of diets. An interesting contrast. No-one I know has been hungry enough to eat anything they can find or choose to eat only lentils because of necessity. I appreciate and admire the filipino ethic of zero waste, but as I won’t even go near Western meat recipes, I remain an interested onlooker in all of this. The Filipino diet may originate from poverty, but middle-class and rich Filipino palates are more open to diverse meat dishes, so it a cultural thing as well. The western palate largely confines itself to flavourful tender, lean cuts. However tasty the flavour potential may be, westerners aren’t usually willing to dig around and work for their food, or to chew and chew to extract it. This means no bones, no fat, no poking around with a fork to pull out the roe. Filipino flavours also tend to be on the sweet side for Westerners. My European palate thought Americans added sugar to everything. Then I came here. The bread is sweet, the mayonnaise is sweet, the meat sauces have a lot of sugar in them. Unlike the Chinese sweet and sour concept, there less balancing of flavour. Filipinos do add kalamansi to many dishes (its a small native lime) but its not always enough in my opinion. So when a newly-arrived American family that has never lived overseas, is served chicken adobo by their newly-hired Filipino cook, there can be some surprises on both sides. The cook may feel she’s done a good job of serving a tasty economical meal. The American is wondering why there is a pile of bones and tons of rice. Its a common point of contention, and some helpers who have worked for American families for years have learnt about American preferences. Many others haven’t. Which way is better is irrelevant if you’re not serving food that your employer likes. 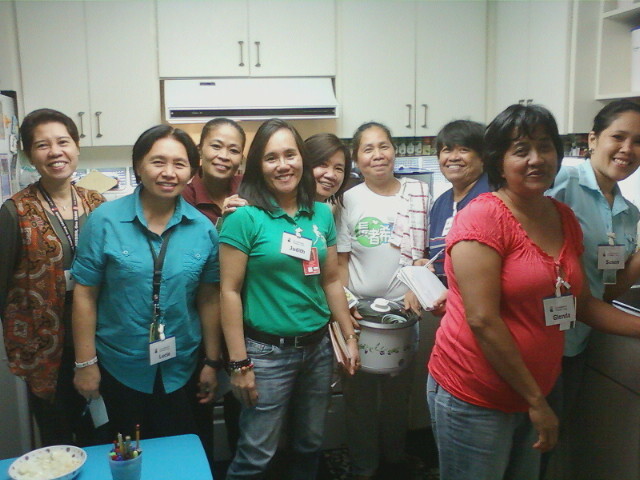 So we decided to assist a little and run a cooking class for helpers on how to serve classic Filipino dishes to Americans. It was well attended, and everyone had a great time. I popped in from time-to-time during the work day to see how it was going. Of course, the class was in Tagalog, so I could only watch and couldn’t understand the instructors message. I did wonder a little if it became an exchange of regional differences on the each dish, rather than a lesson on American preferences. Or perhaps it was both, I can only really learn from the sponsoring families whether anything has changed at the dining table. Time will tell on that. However, the morning itself was great fun, and a it was a privilege to be invited to eat with everyone at the end of their efforts. I also learnt how many food items I mispronounce! On the food front, personally, I continue to be mostly uninspired here. Its been fun cooking with the tropical fruit, but I’ve found the lack of fresh vegetables challenging and without easy access to markets, my food imagination has suffered. I’m not the cook my friends might remember, and this is the first country that I’ve lived in where I haven’t learnt to prepare the local dishes. I don’t expect that to change before we leave, but hope Nepal’s temperate growing climate and more vegetarian-based cuisine will inspire me again. P.P.S. 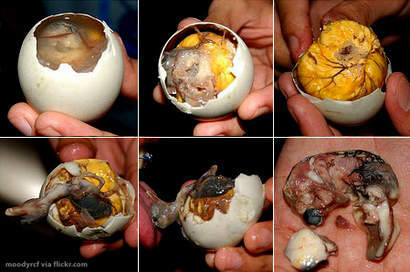 No, I won’t be trying Balut any time soon! ← Would you like fries with that?..